Introduction: The use of laparoscopy in patients requiring peritoneal dialysis is the preferred method of placement. In this case report, we highlight the use of “mini” laparoscopy in a PD patient requiring cholecystectomy. We use this approach based upon the premise that smaller incisions will yield less complications with post-operative peritoneal dialysis therapy. Methods: This patient was well known to our practice, requiring multiple surgical interventions post-PD catheter placement including LOA and incisional hernia repair with biologic mesh. 5mm trocars (non-cutting) were used and the gallbladder was removed via the retro-peritoneal trocar adjacent to the hepatic flexure. Results: The patient presented with abdominal pain and a subsequent workup demonstrated acalulous cholecystitis with borderline abnormal ejection fracture and no evidence of gallstones. The patient was able to resume peritoneal dialysis immediately after the procedure with only minimal leakage using reduced volumes more frequently (In and out flushes). Heparin and TPA were used temporarily due to increased detritus in immediate post-op period; this necessitated a brief hospital admission as we were not equipped for these maneuvers on outpatient basis. At this juncture, we found it most prudent to halt peritoneal dialysis for 72 hours to allow sufficient time for abdominal wall healing following laparoscopic cholecystectomy. The patient was instituted on hemodialysis for this brief period and peritoneal dialysis was resumed without difficulty. Conclusion: Based upon limited results, we find that using the least invasive form of laparoscopy provides a better post-operative outcome for patients on peritoneal dialysis. 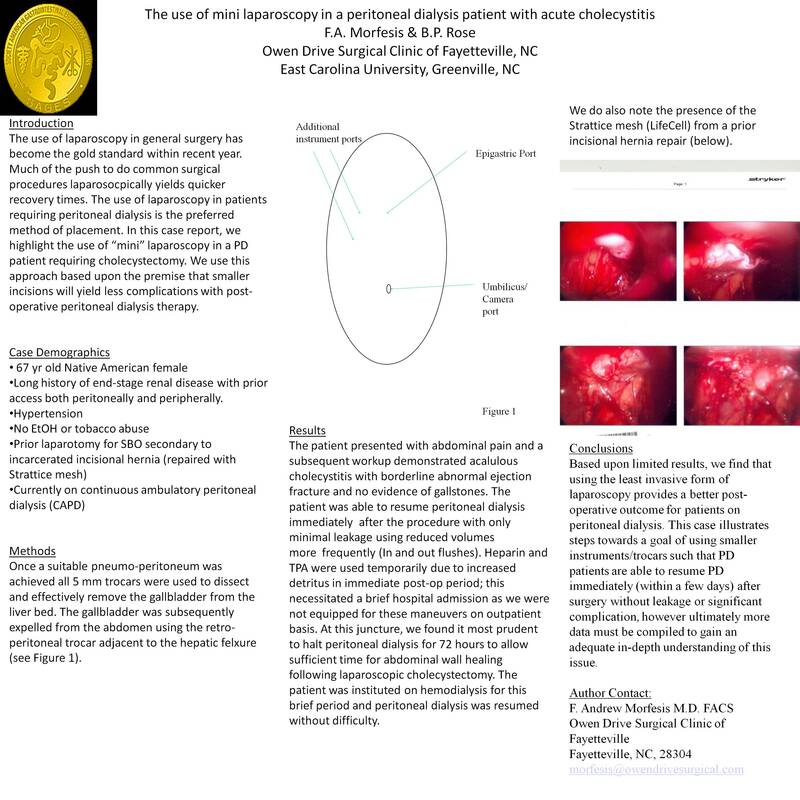 This case illustrates steps towards a goal of using smaller instruments/trocars such that PD patients are able to resume PD immediately (within a few days) after surgery without leakage or significant complication.